Folk music has always been predicated on a dream. It’s the music of a past that maybe was played by people who didn’t live through it. When the chords are plucked for twang and you get a good ol’ hometown wail out of a voice box that just shot back some terrible bourbon, the dream can invade your waking moments and become beautiful. For a second it feels as real as it wants to be. 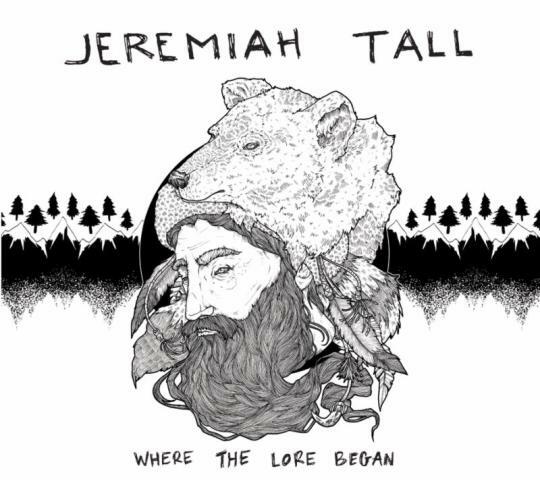 Jeremiah Tall looks like a white, flannel-garbed Reggie Watts, and he sounds like the loudest guy at a Brooklyn beer garden. He’s a man who was named for this destiny, and he sings along to music he created with his whole body. He strums a banjo with a jangle, beats a suit-case with kick-drum pedal, and somehow fits a tambourine onto a limb I’m not certain of. His one-man band fills up the studio, and the dream becomes vivid. He has a debut album called Where The Lore Began, which is a perfect bullseye on the nose. it’s better to go to that barn tonight and get drunk with a bunch of people who smoke pipes. person in the studio. The solitary style suits him perfectly, because he has enough sound to go it alone. The songwriting is forgettable in the best way. It’s hard to tell if you’ve heard this ditty before, if it was something you heard an old man playing on his broken mandolin by the freight train tracks*, or on The Anthology Of American Folk Music, or in the soundtrack to a Coen Brothers film that was assisted by T. Bone Burnett. There’s a hint of punk in his songs—”A Heart At War,” the first song after a one-minute intro, has a real hint of “Lust for Life” in its fast-paced drum-and-one-chord stomp, though the lyrics are much more about his troubled soul yearning for love (of course) than whatever William S. Burroughs absurdity Iggy Pop was going on about—but Tall is more likely to drop out of society than burn it down. Listening to When The Lore Began can feel like the rejection of the strait-laced modern world that Tall’s lyrics can evoke, but it’s a feeling that ends as the last choral chords that close out the haunting finisher “Salvation” cease to reverberate. Jeremiah Tall is an aesthete, and he masters his aesthetic with an admiral precision. But the precision he uses has the trade-off of lacking the depth of a less focused approach. When The Lore Began perfectly encapsulates the hill-country (Bucks County, PA, to be exact) feeling before telephones that it’s going for. But in a world where this album mostly exists as ones and zeroes on your computer, it can become a little thin. It’s a beautiful dream, and extremely vivid one that you can reach out and touch and feel. But eventually you’ll wake up, and you might not remember what it was about. *I’ve always assumed that all of our readers are hoboes from the 1950s. Please don’t correct me if I’m wrong.